We are excited to share upcoming changes to Dana Medical Library’s space and services. This special edition of our newsletter introduces you to learning commons concepts, and Phase One of our transformation: the construction of the Larner Classroom for Team-Based Learning. Construction of a new classroom to support active team-based learning at the Dana Medical Library will begin in early June 2014. The classroom, to be named in honor of Dr. Robert Larner, will be located in the front south side of the Library. Prior to the classroom construction study tables currently located in the front of the Library will be relocated to the rear. To create space for the tables some bound journal volumes will move to adjacent Fletcher Allen storage space on May 19. These volumes will be available on request. Outer walls will be built around the classroom construction site in early June and the new Larner Classroom will be built over the summer. The opening of the Classroom is scheduled for the fall semester. Medical students in the Foundations level (first and second years) will be the first learners using the classroom. The classroom will accommodate 120 students at small tables optimizing the team-based or active learning philosophy. The space will feature flexible furniture to support a variety of learning configurations, multiple projection screens, an advanced video and sound system, and active acoustics to accommodate both small and large groups. The development of the Larner Classroom is a first step in the Library’s pursuit of the Learning Commons approach to offering a content and technology enriched and learner-driven environment. The Dana Medical Library supports the education, research, and clinical practice of students, faculty and staff in medicine, nursing, and the health sciences. Librarians are working with faculty, staff, and students from the College of Medicine and the College of Nursing and Health Sciences to further develop the enhanced space and services. These projects will result in disturbance and displacement for students, faculty, and staff. There will be an impact on study space beginning May 19. There will be noise and disruption at times. We will advise Library visitors of alternative study spaces if the need arises. All Library services including electronic and print book and journal access, interlibrary loan, reference and consultation services will be available during our regular summer hours. We appreciate your patience during the construction period and look forward to the new classroom and reconfigured study space for the fall semester. Contact Marianne Burke (marianne.burke@uvm.edu), Director, or Donna O’Malley (donna.omalley@uvm.edu), Project Coordinator, Dana Medical Library. A Learning Commons (sometimes called an Information Commons or Digital Commons) is an educational space that incorporates multiple information technologies, online or distance learning, tutoring, collaboration, content creation, collections and resources, meetings, and reading or study. Academic libraries began developing learning commons, and the learning commons concept, in the early 1990s. 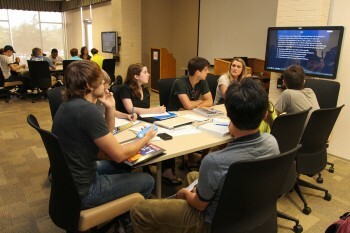 Since then, many university libraries have transformed themselves by including technology-rich classrooms, creating vibrant and flexible collaborative spaces, and offering additional tools and services to meet the wide variety of patron educational needs. As the intellectual and educational center of our community, the Dana Medical Library supports the education, research, and clinical practice of University of Vermont students, faculty and staff. In order better to meet the needs of our patrons, the Dana Library is adopting a Learning Commons model of library service. 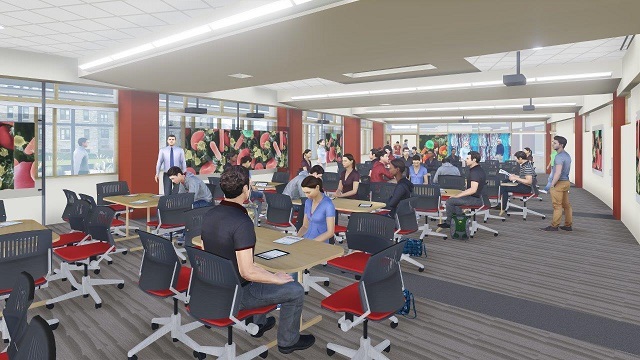 The Learning Commons will offer a media-rich, content rich, and learner-driven environment, with assistance from professionals at various points along the educational continuum. We look forward to engaging our patrons in this exciting transformation over the next several months. For more information about a learning commons, read 7 Things You Should Know About™ the Modern Learning Commons by Educause Learning Initiative. This timeline is accurate to the best of our knowledge on May 15, 2014. Please call or email the Dana Library for more up to date information. May 19, 20 Books, journals, and media in the south end of the back of the library will be relocated. Study space in the front of the library, the computer classroom, and the medical student study will be available. The back of the library will not be open to patrons. Please ask at a service desk if you want a book, journal or media from the stacks. Please ask for assistance with printing at a service desk. Bathrooms in the library will be unavailable. May 21, 22 Electricians will be unwiring tables and lamps in the front south end of the library. In the rear south end of the library air ducts will be cleaned and tested. Books will be stored on carts and media and most journals will be in storage space. Study space in the computer classroom, the back north end of the library, and the medical student study room will be available. Some books and journals will be available on compact shelving in the back north end of the library. The front south end of the library will not be available as study space. Please ask at a service desk if you want a book, journal or media from the stacks. Please ask for assistance with printing at a service desk. Bathrooms in the library will be unavailable. May 23, 24 The carpets in the back south end of the library will be cleaned and will need to dry. Some books will remain on carts. Media and most journals will be in storage. Study space in the front north end of the library, the back north end of the library, the computer classroom, and the medical student study will be available. Study space in the front south end of the library will be available, but there will be no power or data at those tables. The back south end of the library will not be open to patrons. Please ask at a service desk if need help finding a book, journal or media. Please ask for assistance with printing at a service desk. Bathrooms in the library will be inaccessible. May 25, 26 The library will be closed. May 27, 28 Tables and chairs will be moved from the front south end of the library to the back south end of the library. Books that were on carts will be restored to shelves in the back south end of the library. At this point all of the books will be in the library, some on the compact shelving, some on regular shelves. Journals from A to the Journal of Biological Chemistry will be in compact shelving in the library. The remaining print journals, from the Journal of Biological Photography to Z, will be in storage. Study space in the front north end of the library will be available. The back south end of the library will not be open to patrons. Because movers will be carrying tables and chairs from the back to the front of the library down both hallways, the back of the library, the computer classroom, and the medical student study will all be closed. Please ask at a service desk if you want a book, journal or media from the stacks. Please ask for assistance with printing at a service desk. Bathrooms in the library will be unavailable. May 29 The movement of collections and furniture will conclude for this time period. All of the book collection will be in the library, some on the compact shelving in the north end of the back of the library, some on regular shelves in the south end of the back of the library. Print journals from A to the Journal of Biological Chemistry will be in compact shelving in the library. The remaining print journals, from the Journal of Biological Photography to Z, will be in storage. Please ask at a service desk if you need a print journal or a DVD that is located in storage. We will be happy to retrieve it for you. Please let us know if you need help finding a book. Printing and bathroom access will resume as before. Mid-June Renovation begins with the construction of a wall around the new construction zone. We expect the library to be especially noisy while this wall is erected. We will post more details as they become available. If you do anything related to education, you have probably heard of the term “active learning”. People write books and articles about it. They give presentations extolling its benefits. If you search for active learning in Google, you’ll get over 265,000 results. It seems like active learning is everywhere, but what does it really mean? When people talk about active learning, they are usually referring to a style of teaching where students are encouraged to engage with the material they are studying in some manner. Students usually do this through reading, writing, talking, listening, and reflecting in some way with course content. For example, a teacher might have students work on a case study to see how they would apply concepts they have read about. There are several other active learning strategies that can be used in addition to case studies such as discussion groups, role-playing, and journal writing. Ultimately, the goal is to move away from a scenario where the teacher spends the whole class lecturing, while students passively sit and listen. The new Larner Classroom at Dana Medical Library is being built to accommodate 120 students at small tables optimizing the team-based or active learning philosophy. The space will feature flexible furniture to support a variety of learning configurations, multiple projection screens, an advanced video and sound system, and active acoustics to accommodate both small and large groups. Incorporating active learning into a class takes planning and time, but the results are usually worth it. Studies have shown that students in active learning classes learn and retain more information, participate more in class, and do better overall in terms of grades. Teachers usually report that they benefit from active learning too. After all, what more could a teacher ask for then to have a class full of engaged and successful students?